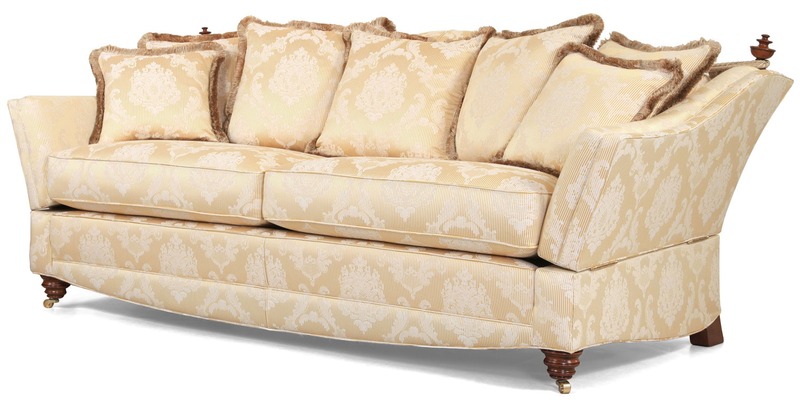 The Victoria Knole is tailored by a single bench trained craftsman, individually hand cut and accurately lock stitched by our quality trained seamstresses to produce an attractive and luxurious piece of the finest quality. The Victoria Knole is tailored by a single bench trained craftsman, individually hand cut and accurately lock stitched by our quality trained seamstresses to produce an attractive and luxurious piece of the finest quality. The model consists of hardwood frame, glued, screwed and dowelled; and full coil mesh top spring unit throughout. The shaped drop arms on polished brass hinges, held by tie backs. Choice of seat cushion fillings available including suptuous Dacron, fibre wrapped foam and duck feather. Scatter cushions are filled with duck feather, however they are also available with fibre. Prices include standard tie backs and trimmings to complement your chosen fabric.